Last night I had a LOT of sweet stuff. 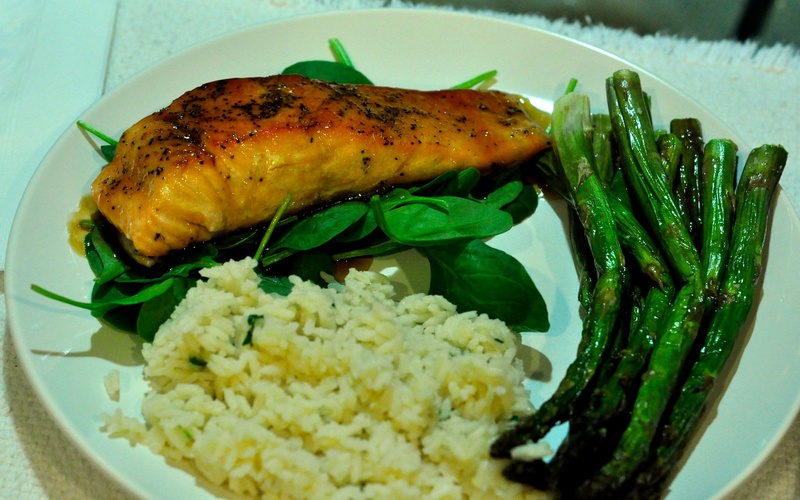 No, I don’t just mean my other half… I mean salmon and maple syrup and honey and sugar — phew. Sugar high with omega 3′s. Is there any other way to do it? Do not answer that! I have been waiting to use the organic maple syrup that Susan gave me and I had some awesome honey (The back label reads: “Made in a cottage food operation that is not subject to Florida’s food safety regulations.”) AKA it is real honey and real good! The salmon came in bulk thanks to Fresh Market’s deal of the week last month – half priced salmon, can’t beat that!!! So I had the perfect storm of ingredients to try to make Maple Glazed Salmon. This is an Epcot recipe, from Le Cellier… I didn’t modify this – they actually had two recipes, I combined them, replacing the bed of watercress with a bed of baby spinach as well as replacing seared with seared and then oven cooked. Personal preference ya know? And… I didn’t do so well with the candied pecans I tried twice, two different ways and they just didn’t work for me, so I left them out. I think next time I make this, I will just add plain almonds – the glaze was sweet enough – I don’t think extra sugar is necessary! Salmon – 4 salmon fillets, 2 cups hearty greens – Frisee or Spinach works the best. Candied Pecans – 2 oz pecans, shelled and in pieces, 2 tsp unsalted butter, 1 tbsp apple juice, 1/2 tbsp turbinado sugar. 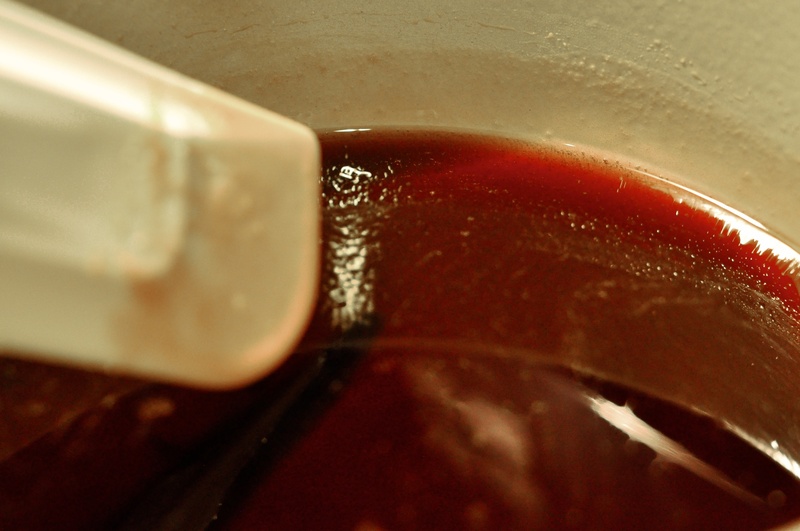 Maple Glaze – 1 cup maple syrup (I recommend organic), 1/4 cup light brown sugar, 1 tbsp honey. Once pecans have toasted, add apple juice stirring constantly. When nearly all the apple juice has been reduced, add the sugar and keep stirring until the pecans have been well coated, take caution not to burn the sugar. Once the pecans are well coated, turn out on to a cooling tray, spaced evenly apart and allow them to completely cool in a low humidity environment. Reserve for salmon. Combine all ingredients in a small saucepan and heat over a low heat, just long enough to incorporate all ingredients and for the sugar to liquefy. Remove from heat and reserve warm for salmon. 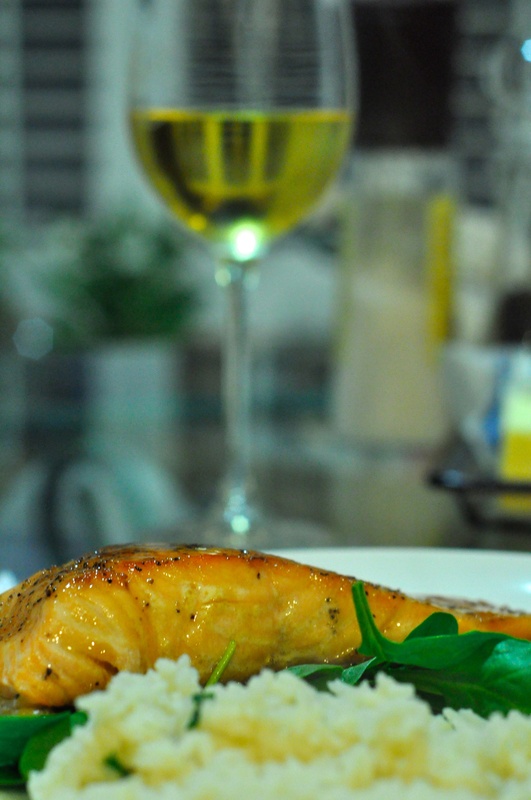 Remove any moisture from the salmon pieces by lightly using 1/4 of the canola oil. Season both sides of the salmon with kosher salt and pepper. Heat remaining 1.5 ounces of canola oil over medium high heat in a large heavy-bottomed non-stick frying pan (I use my faithful cast iron frying pan) large enough to accommodate the salmon without overcrowding. 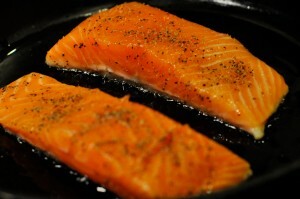 Once oil has begun to smoke carefully place salmon in the pan, skin side down and lower heat to medium. Cook on skin side until skin is evenly golden brown, turn salmon over and repeat. Remove salmon from pan and blot with paper towels to remove any oil or fat. Transfer salmon to baking pan with raised sides and drizzle each piece with half of the maple glaze. Place in oven and bake until cooked. Time will vary depending on the thickness of the salmon – average 5-10 minutes. While salmon is baking, arrange raw baby spinach on plates. When salmon is done, place the pieces on the spinach and drizzle with maple glaze and sprinkle with pecans! I served this with Jasmine rice and roasted in the oven with olive oil and salt asparagus. YUM. Thank you Brett for taking the photographs for me and always encouraging me to push past what I think my limits are. I am always thrilled when I try something new and he eats it up and goes back for more.